The old cupboard of the twentieth century is creaking, the skeletons are falling out. 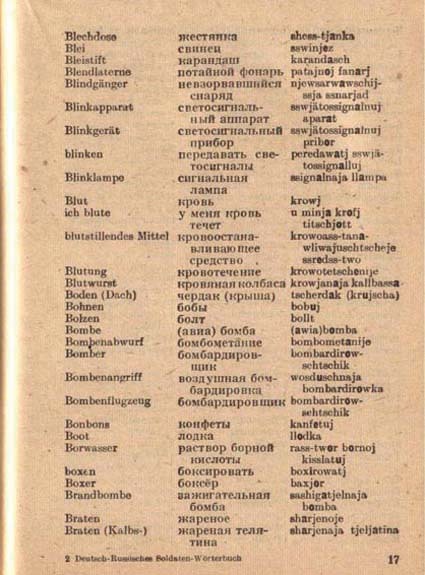 After the Russian-Estonian and Russian-German phrasebooks, here you are the counterpart of this latter: a German-Russian dictionary established in the Wehrmacht. 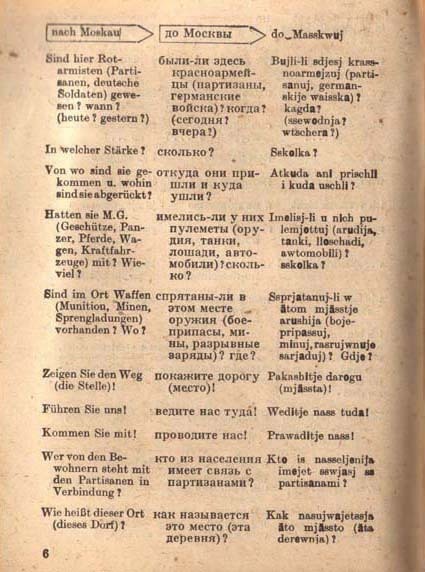 In this booklet, however, conversation falls in the background, and after four pages of “Redensarten,” the most frequent idioms, it functions as a simple word list for seventy more pages. But even so it has several surprises in store for the practicing translator as well. We had absolutely no doubt about it. 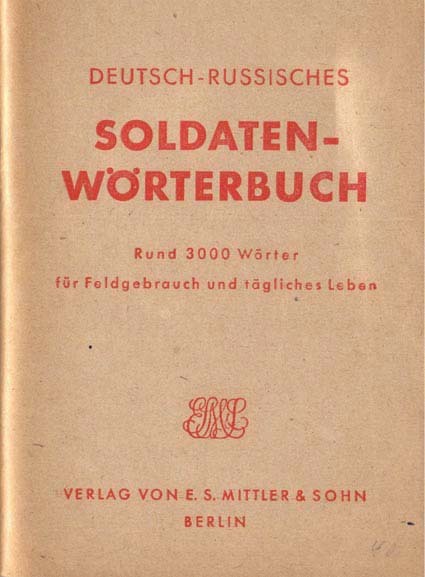 The lack of the conversational part is most probably due to the fact that the first edition of this booklet was compiled for the purpose of a Blitzkrieg, and if everything went according to the plans, then by the time the soldiers would have mastered the necessary locutions, there would have been nobody left to practice with. The protraction of the war made necessary the publication of a second edition in 1942. 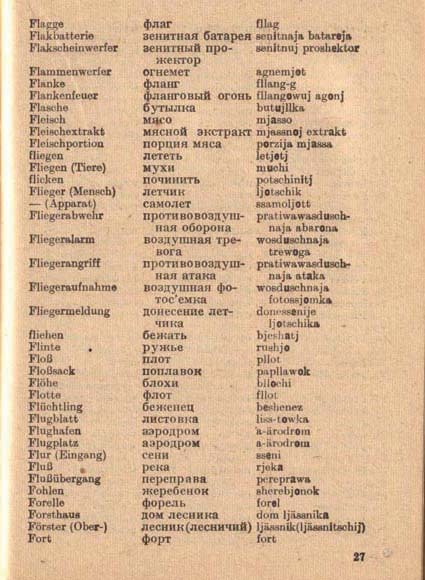 In this one the amount of vocabulary was doubled, four pages of expressions were added, and the example of declination introducing them which, in the interest of strategic deception, had been “до Львова – Nach Lemberg” was now openly changed for “до Москвы – nach Moskau”. The editor of this pocket dictionary was the Mittler & Sohn publishing house, founded in 1796, which from the end of the 19th century gradually became one of the largest German military publishers. 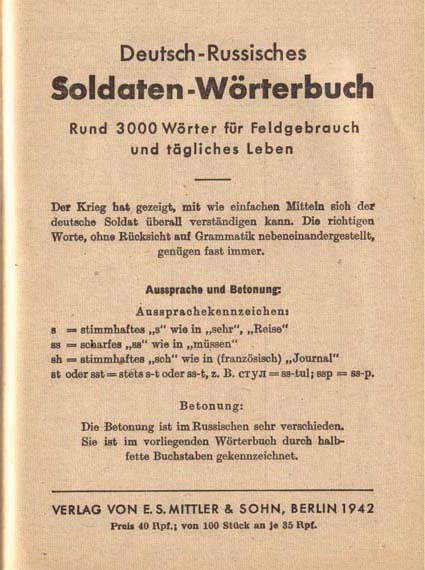 They started the compilation of military dictionaries as early as the end of WWI, still as “imperial editors,” and by 1939 they already possessed an up-to-date series in the languages of most of Germany’s allies and enemies. This period is covered by a benevolent darkness in the short historical overview of the publisher, but Mittler and his actual son still make good profit on the capital accumulated at those times: in their list of new publications (here I saved the list of today) eight out of sixteen items focus on WWII, beginning with the biographies of Hitler’s admirals.